Bart's Bash unites sailors in one colossal global sailing event. The event, founded in 2014, is run in memory of Olympic and AC sailor Andrew 'Bart' Simpson, and the annual fundraising and mass participation campaign is in aid of - and is organised by - the Andrew Simpson Sailing Foundation. 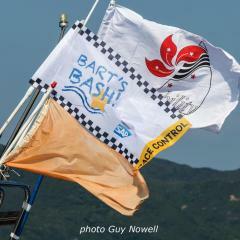 Verified by Guinness World Records as 'The Largest Sailing Race in the World', in the last two years Bart's Bash has seen over 45,000 sailors participate in the event in 62 countries. Now in its third year, the event has 58 countries and 354 venues involved. There are three entries from Hong Kong; Sailability HK (hosted by Hebe Haven Yacht Club), Lantau Yacht Club and Discovery Bay Yacht Club.